Each month, your Neighboring Food Co-ops feature our region’s artisan cheesemakers by offering a specially selected cheese at great price. Look for the “Cave to Co-op” sign in the cheese section at your local food co-op. To find one near you, visit www.nfca.coop/members. Jasper Hill is a working dairy farm with an on-site creamery in the Northeast Kingdom of Vermont, owned and operated by brothers Andy and Mateo Kehler and their families. An underground aging facility maximizes the potential of cheeses made by the creamery, as well as those made by other local producers. Leftover whey from the cheesemaking process is fed to heritage breed pigs, roaming the woodlands beyond the cows’ pasture. Jasper Hill’s mission is to make the highest possible quality products in a way that supports Vermont’s working landscape. The Kehlers are driven to be the standard bearer of quality and innovation in the artisan cheese industry while promoting a regional taste of place. They and their growing network of collaborators look forward to an ever more diverse and thriving agricultural tradition in the Northeast Kingdom – one that creates a regional identity for the product developed to suit the region, culture and ambitions for a sustainable future. 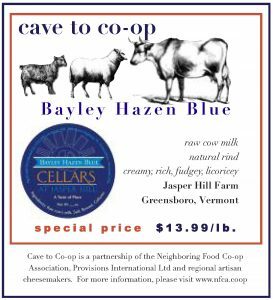 Bayley Hazen Blue is a Jasper Hill Farm original, and is made from their high-quality whole raw milk. It is named for an old military road commissioned by George Washington during the Revolutionary War. Though no major battle ever took place, the road brought Greensboro its first settlers and continues to be used today. Bayley has developed a loyal following because of its fudge-like texture, toasted-nut sweetness, and anise spice character. The paste is dense and creamy, with deep blue veins. The usual peppery character of blue cheese is subdued, giving way to the grassy, nutty flavors in the milk. The texture and flavor make Bayley an ideal choice for any lover of blue cheese, but with a balance of flavors that renders it accessible to those new to the style. Try pairing with a fruity red dessert wine, toasty Imperial Stout, or a hunk of dark chocolate. Bayley is also ideal for crumbling over a juicy burger or adding to a salad with spinach, walnuts, and dried tart cherries. Or try one of these recipes! Line a rimmed baking sheet with foil and place a wire rack on top of the foil. Open each date and fill with blue cheese. Gently press the sides together and wrap each date with a piece of bacon. Place dates bacon-seam side down on wire rack. Bake for 20 minutes, until bacon is crispy, turning the dates over about halfway through. Serve warm. In a large skillet over medium heat, cook the bacon until crisp, around 8-10 minutes. Remove the bacon and drain it on a piece of paper towel. Pour off all but ¼ cup bacon fat. Lower the heat and stir in the flour and cook, stirring often with a wooden spoon, until the flour is lightly browned, around 3-5 minutes. Add 1 ½ cups of water to this mixture, along with the vinegar, sugar and mustard and let it all come to a simmer. Whisk the mixture frequently until the dressing is thick like gravy and coats the back of a spoon, around 10 minutes. Season to taste with salt and pepper and remove from the heat. Put the iceberg wedges on plates, drizzle generously with the warm dressing and sprinkle with the bacon, blue cheese and parsley. Serve! Use extra sauce on vegetables. Put the broccoli in a bowl, drizzle with the olive oil, and sprinkle with salt and pepper. Toss it all to coat the broccoli evenly. Transfer to a gratin dish. Nestle the garlic down in amongst the broccoli and place the dish in the oven. Roast until the tops of the broccoli are beginning to brown and the stems are crisp-tender. Remove the dish from the oven and remove the garlic. Sprinkle the top of the broccoli with the blue cheese and then the breadcrumbs. Return to the oven and cook until the cheese is bubbly and the breadcrumbs are golden. Serve hot or warm. Butter a 9 inch baking dish. In a medium bowl toss the pear slices with the lemon juice. Add 1 tablespoon of the flour, the cane sugar, the port and mix gently until the flour is absorbed by the liquid. Spread evenly in the bottom of the baking pan. In a dry medium bowl mix the remaining ½ cup flour, the nuts, the brown sugar and the salt. Add the butter pieces and work the mixture with your fingers, until it resembles large crumbs. Sprinkle this over the pears and bake until the pears are tender and the mixture is bubbly, around 40 minutes. Remove the pan from the oven and sprinkle the Bayley Hazen Blue over the top. Return to the oven and cook until the cheese is melted, around 5 minutes. Remove from the oven. Let the crumble sit for 5 minutes, then serve with a little puddle of heavy cream. Cut the stalks off the figs and then cut an X into the top going about half way down the fig. Place in a small shallow baking dish. Divide the Bayley Hazen into 6 chunks. Press a piece of cheese into the fig and then gently pull the side up over it. Bake for 10-15 minutes, until the figs are warm and the cheese has melted. Remove dish from the oven; and drizzle figs with honey. Serve. CAVE TO CO-OP IS A PARTNERSHIP BETWEEN PROVISIONS INTERNATIONAL AND THE NEIGHBORING FOOD CO-OP ASSOCIATION (NFCA) TO SUPPORT LOCAL, ARTISANAL CHEESE PRODUCERS IN OUR REGION AND MAKE THEIR PRODUCTS MORE EASILY AVAILABLE TO CO-OP SHOPPERS. THE NFCA IS A NETWORK OF MORE THAN 30 FOOD CO-OPS IN NEW ENGLAND, LOCALLY OWNED BY MORE THAN 90,000 PEOPLE LIKE YOU. FOR MORE INFORMATION, PLEASE VISIT WWW.NFCA.COOP.